When I originally signed up for the Keenspace account we used, I needed to have some sort of "comic" to submit in order to activate the account. Adrian and Peter always came across to me as your classic comedic duo - the "fool" and the "straight man". With that in mind, I came up with this pic. At first, I as well went with the "fool" and "straight man" concepts, but as we got on with the comic, I felt the roles should change, making the characters more complex and three dimensional. 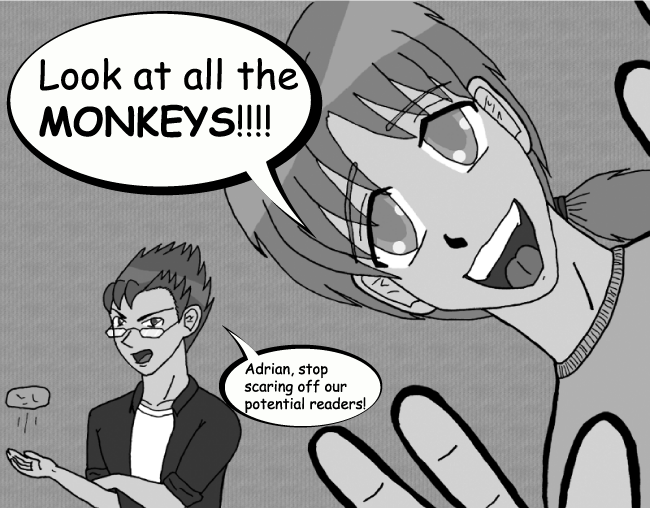 The basic idea for this preview was the old "readers as internet monkeys" concept. I think we ripped that one from Megatokyo. That, and the constant "writer as cantaloupe" gag Mark always liked to use. WolfBoy Comics, Daze in a Haze - copyright © 2002-2005 Mark Voisine. Co-Created by Anson Smith. All rights reserved.